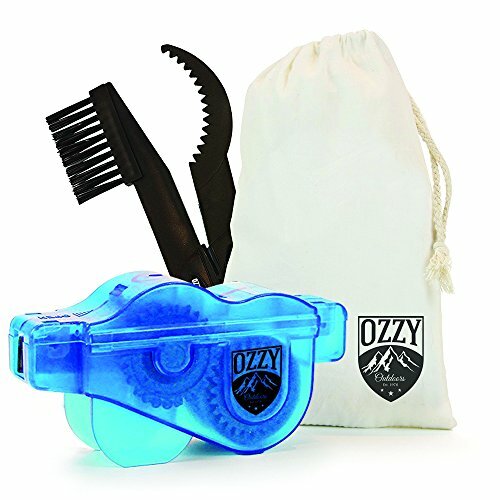 - The Ozzy Outdoors Chain Cleaner makes quick work of getting into the nooks and crannies found around derailleurs, the cassette, cranks, and chainrings. For a limited time, enjoy a free gift with purchase! A Bristle Brush and Notched Scraper- A $7.99 Value! ✓ SMARTER DESIGN- Our cleaner looks similar to some of our competitors but is different in key ways. Other products utilize two clamps on the end- the problem with this is that when the clamps get wet, fluid spurts everywhere. The Ozzy Outdoors Chain Cleaner utilizes a single clamp in the middle of the device to lock the product together when cleaning. ✓ VERSATILE- Works with all types of bikes- if it has a chain, Ozzy can clean it! For free wheel designs, simply attach the cleaner to the chain and use the pedal to turn the chain. For bikes with coaster brakes, the bicycle must be elevated or flipped over in order to work. ✓ CONVENIENT- Cleaner clips directly to the chain-no need to remove the chain from the bicycle-cleans quickly and easily in just one minute. Simply fill the chamber with your choice of cleaner. Purists insist the best cleaner is mineral spirits and others prefer citrus degreaser- the choice is yours! ✓ DURABLE- Made from heavy duty plastic to ensure a lifetime of superior performance. No flimsy metallic pieces to rust and break away. No useless sponges that fall off after a few uses. Just simple, thorough, rotating scrubbing brushes encased in strong plastic to keep your chains clean. If you have any questions about this product by Ozzy Gear, contact us by completing and submitting the form below. If you are looking for a specif part number, please include it with your message.